Home / Business / Technology / Could MPLS be the Next Step for Your Business? Could MPLS be the Next Step for Your Business? If you’re not an IT expert, it’s easy to assume that your current IT network is all that is possible. In reality, an IT network is just a concept – and it’s one that can be realised in a huge number of ways – each offering slightly different advantages and features. An MPLS system is an element of an IT network that can truly revolutionise the way your business works – but without an understanding of exactly what it does, you may not be sure whether it’s exactly right for you. IT professionals are likely to bounce the term ‘MPLS’ around as part of their common language – but for non-IT folk, it’s another acronym that’s meaningless without having it broken down – so let’s do exactly that. MPLS stands for Multi-Protocol Label Switching – and, although it sounds complex, it’s actually quite an easily understood system. A protocol is a language that IT devices use to communicate with one another It’s not quite a language – instead, it’s a set of rules that explain how data should be used. As long as two devices are working with the same protocol, data passed between the two will be handled in the same way. Hence, Multi-Protocol simply means that an MPLS system can be used on networks where more than one protocol is being used between compatible devices. The ‘Label’ part of the system is very close to how we use labels in non-IT terms. Essentially, a digital label is attached to data as it passes through the network – and this label will be used to identify what priority should be given to the data – and, therefore, how it should be handled. The ‘S’ part of the acronym stands for ‘Switching’ – due to the fact that a ‘Label Switch Router’ is being used to identify the label that’s applied to packets of data – which is then handled accordingly. Now you know what the initials stand for, it’s worth thinking about how MPLS works in real terms. It’s useful to think of MPLS as a traffic management system. Without MPLS, your network’s traffic management system is only really policed by its bandwidth (the amount of traffic it can handle at any one time). No particular data is any more or less important than anything else – so, non-urgent emails and other non-priority data transfers are getting caught up on the same freeway as the data that you’re relying on being transferred to keep your important video conference calling going. Without MPLS, data crossing your network is a free for all – but, with MPLS, there’s so order brought to proceedings. With the help of the labels and route switching system, MPLS will make sure that all traffic is routed intelligently – according to priority level. Got a mission critical system that you can’t have fail? That’ll be marked as an absolute priority – whereas non-urgent systems will come further down the pecking-order – as there’s not as much business impact if they’re slightly delayed. What benefits does an MPLS system offer? If you’re going to make MPLS your next business step – then knowing how it will improve your business is vital. 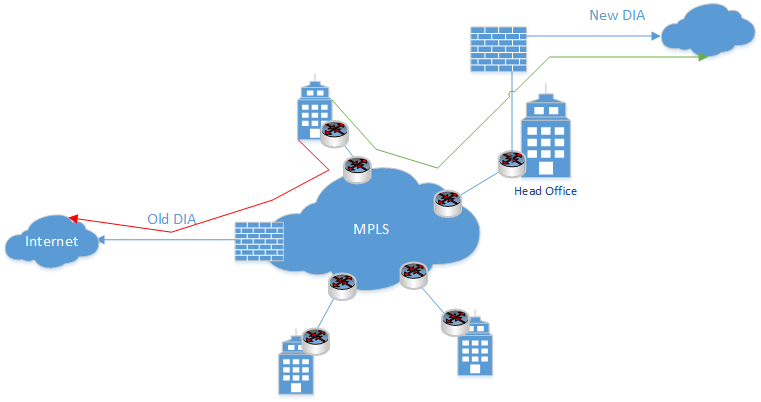 So, what does MPLS look like in real terms? If you’ve got a busy IT network, it’s common for congestion to occur. Congestion happens when the amount of traffic trying to pass the network surpasses your bandwidth – then, the only way to free up space is to drop some of the data – diminishing the quality of your service. With an MPLS system, traffic will be routed on non-standard paths, so all data is delivered quickly – and according to priority. Modern businesses often use real-time, cloud-based applications to deliver their service. While this way of buying and working with applications offers a huge number of business benefits, the cloud-based nature of the software makes it sensitive to poor performance. With the switching mechanism that an MPLS system uses, real-time applications are boosted – leading to a better and more reliable service delivery – and therefore, a better end-user experience for employees and customers. MPLS systems are fantastic at simplifying connections between devices and locations – and, as such, this makes the job of IT professionals working on your network much easier. When data is labelled correctly, it’s fast-tracked through your network – even if it spans countries or continents – removing a host of variables that hinder maintenance work on your infrastructure. Expanding a traditional – non-MPLS – network is likely to require a huge amount of effort from an IT team. This is because virtual connections need to be set up between your current location – and the location that you’re expanding to. Setting up these ‘tunnels’ safeguards your data as it crosses geographical locations – but MPLS supersedes this requirement – automatically ensuring that your data finds the most efficient route to its end goal. How should you go about implementing MPLS? Does your network handle different data types? Does your network service different locations? Do you experience congestion and delays with your applications? Do you rely on real-time services? Would it be useful to bring new sites quickly into your network? If so, it’s worth looking into finding an MPLS provider – as well as making sure you’re getting an MPLS service that perfectly suits your network and business requirements. Finding the perfect service for you might take a bit of time and research – but, it’s an investment that will pay off right across your service.